One thing that Windows lack is a clipboard manager. If you are unsure what a clipboard manager does and when you can use it, then let me give you an example. Suppose you are working on a document and you have two more documents open, doc A and doc B, as reference from where you are taking data and other snippets of information while preparing your document. Say, you have a certain piece of text X that you have to insert repeatedly at a number of position on your document. Apart from that, every now and then you are copy pasting lines, tables and other pieces of information from doc A and doc B to your own document. Now since you have only one clipboard, i.e. at any time only one object can be copied to the clipboard, every time you have to insert the text X you have to copy it and then paste it and then it would be replaced by some other item and again you have to copy it the next time you paste it. A lot of time is wasted in copying the same item over and over again. This is when a clipboard manager comes handy. 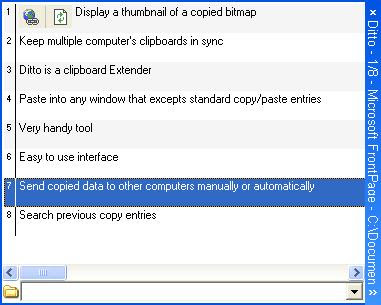 A clipboard manager allows you to make multiple copies of object and keep all of them on the clipboard at the same time, allowing you to select and paste anyone of the copied data into your document. There are a handful of clipboard manager available, but none is as good as Ditto. Ditto is an extension to the standard windows clipboard. It saves each item placed on the clipboard allowing you access to any of those items at a later time. You can copy an item and then forget about it, because Ditto will save it for you. You can even retrieve information you copied several days later!! It runs as a small icon on the system tray and does it's work quietly. I'm using ditto for the past 5 months .It's portable-simply put the best clipboard manager ever. You can organize the clipped info into groups..really a great feature not seen in other clipboard applications.